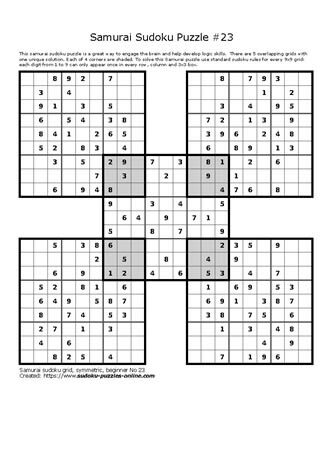 Samurai Sudoku puzzle, often called fiendish or extreme Sudoku, supports brain health as it challenges the brain to work logically, while following basic Sudoku rules. Using these rules, start solving the shaded areas, remembering that there are two grids that need to considered at the same time when solving for that common shaded area. Rules state that the digits 1-9 can only appear once in each row, once in each column and once in each of the individual forty-one 3x3 grids found in the larger puzzle. Challenge family and friends, either individually or in pairs, to see how long it takes to solve this puzzle. The puzzle has been rated as easy, or beginner Samurai Sudoku.